Schmorl's Node: What is it? How is Diagnosed? What Should You Do? Chiropractic Specialty Center® provides the Best Schmorl’s Node Treatment. Call now to book your appointment today! By definition, a Schmorl’s Node (also known as Schmorl’s nodules), is either a downward or upward notching or protrusions (pushing) of the spinal disc into the cartilaginous structures, and bony surfaces of spinal bones called vertebrae. Schmorl’s Node is a common occurrence of degenerative changes that come with aging, detected in routine spine x-rays. However, it may also be found in young adults and even teenagers. Schmorl’s Nodes or Schmorl’s Nodules (spine nodules) in young adults and teenagers are often the results of a hereditary predisposition. 70% of those diagnosed with a Schmorl’s nodes are said to have a genetic predisposition. In essence, a Schmorl’s Nodes is a vertical herniation of the spinal disc. This herniation often results when there is a weakness in the vertebral end-plates. Although most cases are asymptomatic, they are clinically significant. 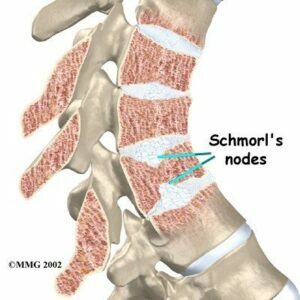 A clinical research study of 400 back pain patients reported Schmorl’s nodes in about 20% of the participants. Therefore, you should take steps to avoid the complications of additional spinal disorders as you age, if you have Schmorl’s Nodules. As such, it becomes a point of clinical significance, especially when the discovery of Schmorl’s Nodes is in teenagers and younger adults. How are the Nodes Diagnose? The most common diagnosis of Schmorl’s Nodes is through spinal x-rays. But, CT-scan and MRI assessments offer a much greater detail of the vertical disc herniation. X-rays, Ct Sans, or MRI tests will show a notch or a bump seen pushing into the vertebrae. This little notch is called a Schmorl’s Node. As mentioned earlier, the diagnosis of Schmorl’s Nodes in the young adults is a point of concern. Although the vast majority of these cases are genetically linked, there are some who develop it as a result of excessive load-bearing activities. The nodes themselves are not painful, but they interfere with the transfer of nutrients from the spinal vertebrae to the spinal disc. The spinal disc does not have a direct blood supply and as such are considered avascular. However, they still require a constant flow of blood, which brings in the needed nutrients. The nutrient-rich blood to the spinal disc is obtained through the process of diffusion or soaking up. So, the spinal discs are dependent on the blood vessels within the vertebrae to give them nutrition. Without the needed nutrient, your spinal disc becomes weak, wearing, slipping, and tearing prematurely. So, while Schmorl’s Nodules do not cause pain by themselves, they can lead to other conditions that can. What is the Clinical significance of These Nodules? In short, if you have it, it means that there is a weakness in your end-pates. The endplates are the caps situated at the top and bottom of every spinal disc. These are anchors used to connect the spinal disc to the spinal bone. Also, the vertebral endplate is the structure needed to transmit the required nutrients to the spinal disc. Therefore, any weakness in the spinal end-pate will have a direct impact on the health of the spinal discs. As such, those diagnosed with Schmorl’s Nodules will develop spinal disc disorders. Therefore, precise preventive plans and even lifestyle changes for the young adults diagnosed are critical regardless of your age at the time of diagnosis. Teenagers and young adults need urgent preventive measures that help avoid progression. The same applies to older adults, as Schmorl’s Nodules can progress and cause the collapse of the spinal bone, leading to significant pain and even disability. 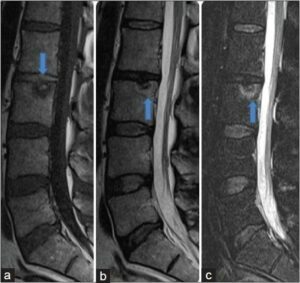 What are the Treatment options for Patient with Spine Nodules? Although there is no specific treatment for Schmorl’s Nodes, there are things that one diagnosed with such condition can do to prevent other more spinal severe diseases such as degenerative disc disease, herniated disc (slip-disc or slipped disc) or fragmented disc. Prevention is better than cure, and for those that have Schmorl’s Nodes, they need to heed the warning. In short, you if you have Schmorl’s Nodes, it would be best for you to partake in a preventive program to avoid the nasty pitfalls of a slipped disc. Prevention should not just be through care or therapy programs, but also changes in lifestyles. It is best to avoid heavy lifting or contact sports at a young age. It is best not to do the heavy lifting with a young spine. If you have spinal disc problems and Schmorl’s Nodes are involved, don’t worry because at the Chiropractic Specialty Center® we use unique and cutting-edge technology to repair your injured spinal disc. Our expert Chiropractic care plus our clinical physiotherapy is an unmatched collaborative method of care. We can provide results not available anywhere else. If you have pain from muscles, ligaments, joint or spinal disc, call our center today. We are Malaysia’s premier center for neck pain, back pain, slipped disc (slip-disc) and sports injuries. 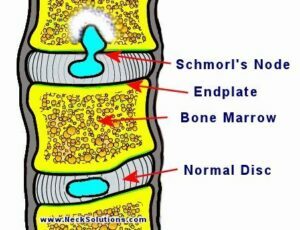 If diagnosed with Schmorl’s Node, call us today for targeted therapy and effective preventive and management program.